Highlights of Georgia & Armenia – The Great Canadian Travel Co.
On this trip see soaring mountains, lakes and waterfalls. 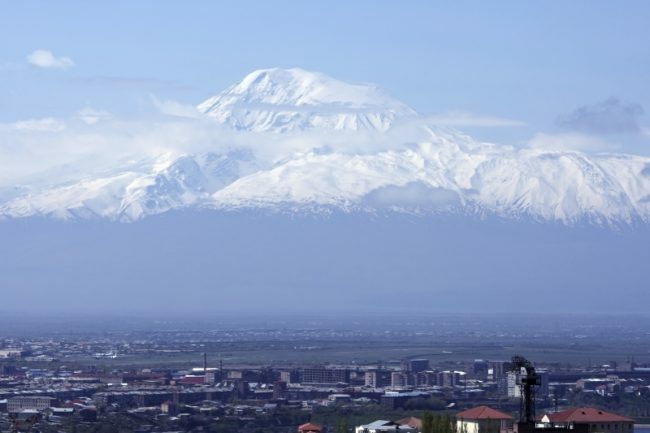 Beautiful scenery is plentiful in both countries as Mount Ararat towers majestically over Yerevan and the Caucasus Mountains can be seen from Tbilisi. Prices are shown in CA$, per person based on two people sharing a room or one person in a single room. Fly to Yerevan from your home gateway. 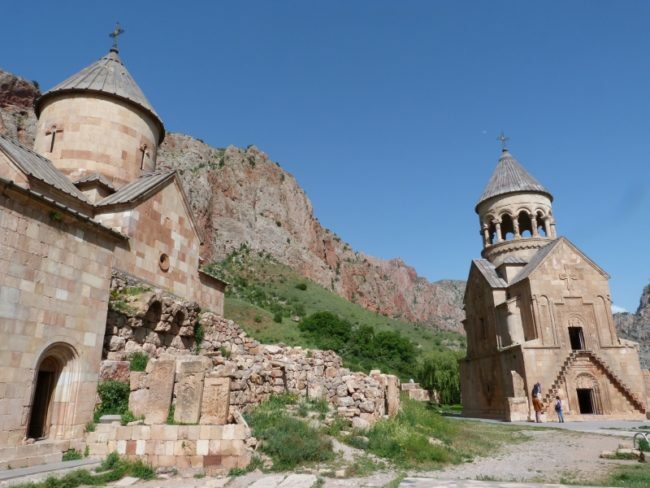 A short drive takes us to the churches of Hripsime and Gayane followed by Echmiadzin. 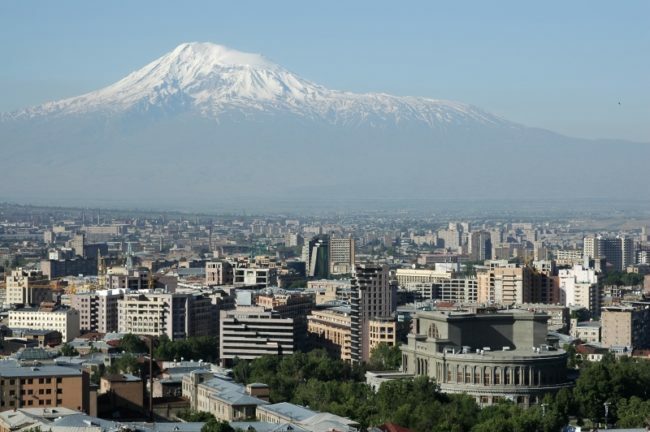 This was the capital of Armenia from 180 to 340 AD (when Christianity was first adopted by the Armenian people). The main Cathedral sits amongst hedges and lawns where bearded clergy in dark robes sit in theological debate. In the gardens there are many fine khachkars (carved cross stones) and bell towers. After lunch visit the impressive 7th Century ruins of Zvartnots Cathedral. Onto the Genocide Memorial and museum, dedicated to the massacre of 1.5 million victims in 1915, the visit will help us understand how the huge Armenian diaspora community has developed. In the morning we drive for 1 hour to Geghard monastery (a UNESCO site) where on the hillsides you can still see caves that housed monastic cells. A short drive takes us the village of Garni where we explore the only pagan temple in Armenia. After lunch we return to the city, in time to sample the thriving café culture of Yerevan. Today is a long, but fascinating day. First we visit the Matenadaran, Armenia’s ancient manuscripts library, an imposing building at the top of Yerevan’s grandest avenue. Leaving Yerevan we drive to the monastery of Khor Virap, one of the holiest sites in Armenia, with stunning views of Mount Ararat behind. 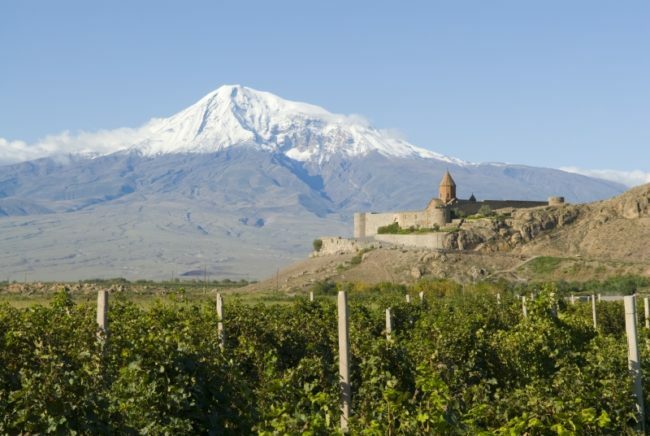 Our second stop is in Areni village where the finest Armenian wine is produced. Here we visit a winery and have a tasting. The next stop is Noravank where after lunch we visit the monastery (a masterpiece of the 13th Century architect Momik) is dramatically located in the canyon. Afterwards journey for approx. 3hrs to the small town of Goris. Another long day starts by taking one of the world’s longest cable cars we visit the Tatev Monastery, perched on the edge of the Vorotan Canyon. A two hour drive takes us to part of the ancient Silk Road, we stop for a lunch break then climb for another hour up to the well-preserved, 14th Century Selim caravanserai. From here we continue to the top of the pass where the landscape changes, before descending to the blue waters of the Lake Sevan. We make a stop at Noraduz to see the ‘forest’ of khachkars (cross stones which incorporate both Pagan and Christian symbols) before continuing to our hotel on the shores of Lake Sevan, the largest lake in the Caucasus. The lake is volcanic and lies at an altitude of 1950m reflecting the sky like a mirror and changing colour several times a day. After breakfast we visit Sevanavank, the monastery with commanding views of Lake Sevan. We then head north, to Lori – the lush alpine region of northern Armenia. After a short stop in Dilijan, a small town known for its arts and crafts, visit the 12th Century Haghartsin Monastery, nestled in a forest valley. This beautiful site, whose name means ‘Dance of the Eagles’, was built by two brothers, princes of the Bagratuni kingdom. On the way to Haghpat, we pass Molokan villages. Molokans (Milk Drinkers) are a sect of Russian Old Believers who broke away from the Russian Orthodox Church in the 16th Century. Our final morning in Armenia includes visits to the impressive UNESCO sites of Haghpat and Sanahin. After lunch in Alaverdi we will continue on to cross the border. 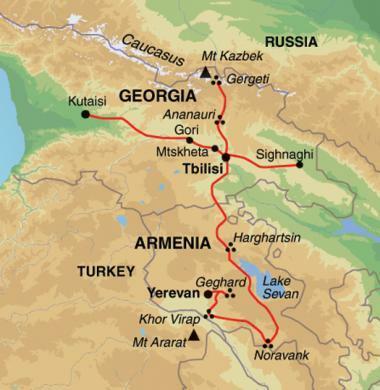 Here we say goodbye to our Armenian leader and driver and walk approximately 10 minutes across the border into Georgia, where we will be met by our new guide, and travel onto the capital Tbilisi. Our hotel is a short walk to the cafes and restaurants in the wonderfully restored historical centre. Much of Tbilisi can be visited on foot and in the morning we will explore the old town. We will see the ancient sulphur baths, Sioni Cathedral, the main church of Tbilisi, which dates from 7-19th Century, and the beautifully decorated synagogue, built at the beginning of the 20th century. We visit Rustaveli Avenue, the main artery of Tbilisi and the Treasury of the State Museum, with its fantastic collection of per-Christian gold artifacts and jewellery. The rest of the afternoon will be free and there is a lot to explore with many art galleries, handicraft and painting markets and the enormous new Holy Trinity Cathedral all within reasonable distance from our hotel. After breakfast we will take a long drive up the Georgian Military Highway, through the great Caucasus Mountains via Ananuri Church. Our goal for the day is the town of Stepantsminda (formerly Kazbegi) where, after lunch we walk up through the village of Gergeti to the landmark Holy Trinity church. The walk will take us about 2-3 hours in total. For those who don’t want to walk, local jeeps can usually be rented for a reasonable cost. Hopefully we will have clear views of Mount Kazbek, the third highest of the Georgian Caucasus Mountains, soaring to 5047m. We will drive back to the ski resort of Gudauri, where we have dinner and spend the night in a cosy alpine hut style hotel. Today is our longest day. We drive three hours to Uplistsikhe which was once an enormous cave town dating from per-Christian era. In times of siege dead bodies were temporarily buried in jars until they could be peacefully re-buried and a large underground tunnel to the river for water collection still exists. Ancient temples and theatres can still be identified and we walk up sandstone steps for a windy view across the river and plains. We take a short drive to the town of Gori, birthplace of Josef Stalin. Visiting Stalin Square where a huge statue of him used to stand we take a guided tour of the fascinating museum of his life and role he played within the Soviet Union. Stalin’s bulletproof train carriage, which he used to travel to the Potsdam Conference in 1945 lies in the grounds of the museum its worth a visit for its simple but elegant interior. The small wooden house where he was born is also here encased in a temple like structure! There are still people in Georgia who greatly admire Stalin. We then continue to Kutaisi where we spend the night. After breakfast, we visit the ruins of the 11th Century Bagrati Cathedral poised promontory above the river and travel to the Gelati Academy and Monastery – founded by King David the Builder in the 12th Century – it is no surprise to find he chose yet another superb location for this monastery, where the monks were members of the royal court. Both sites, Bagrati and Gelati, are on the UNESCO World Heritage in Danger list since 2010. From here we drive to the lovely Borjomi-Kharagauli National Park and take a guided walk. We then continue to the small ski village of Bakuriani where we will spend the night in an alpine hut style hotel. We now travel back to Tbilisi, stopping at Mtskheta, the former capital of Georgia where we will see the 11th Century Sveti-Tskhoveli Cathedral, the largest functioning cathedral in Georgia. 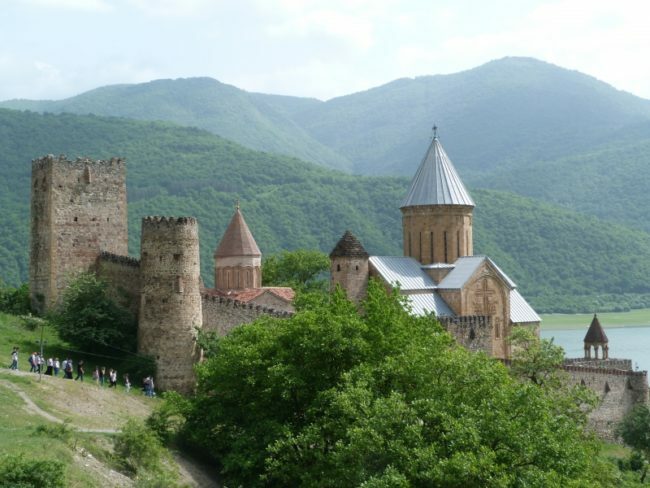 However, the main reason people visit Mtskheta is to see Jvari church, perched on a hill overlooking the valley and built in the 6th Century on the spot where St. Nino set up her cross in the 4th Century; converting the town from paganism. Heading on to Tbilisi we will have some free time to enjoy this historic capital, dating back to the 4th century AD. After breakfast we leave Tbilisi driving east to the wine region of Kakheti, here we visit the recently renovated royal town of Signagi. Lunch will be taken at a local winery where we will enjoy traditional cuisine and have the opportunity to taste the local wines. From here we continue to the citadel of Gremi on the banks of the Intsoba river. 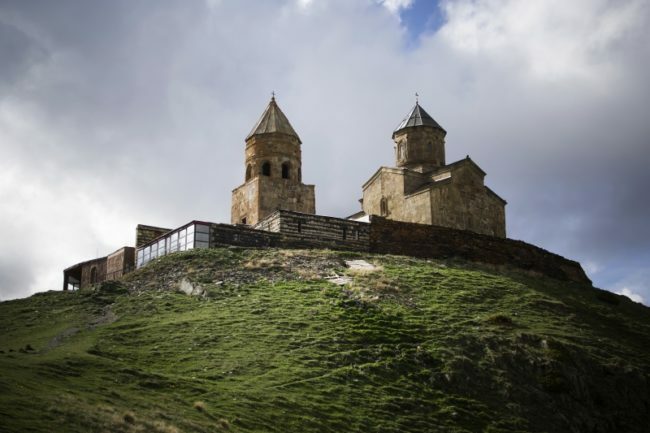 And then we visit the 11th Century Alaverdi Cathedral – the main spiritual centre of this region- surrounded by impressive defensive walls dating mainly from the beginning of the 18th Century. We make our way back to Tbilisi for our final night in Georgia. 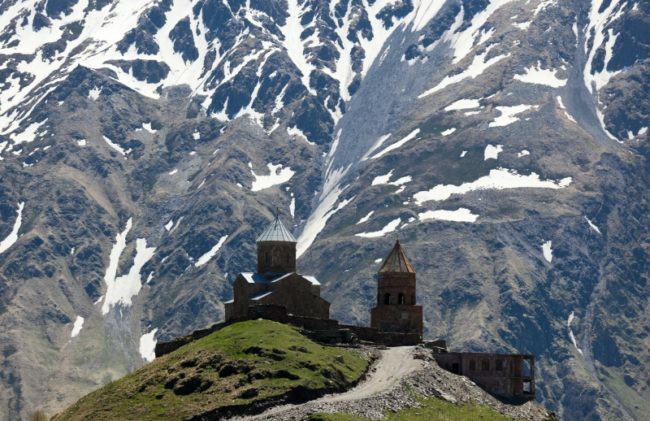 Georgian and Armenian churches and monasteries are, almost without exception, built in stunning locations. Surrounded by forests, perched on the top of dramatic gorges or silhouetted before snow-capped mountains, they draw us to magnificent open spaces filled with a huge variety of trees and wild flowers. Accommodation Details: You will spend 11 nights in hotels and 2 nights in guesthouses. Two nights are with facilities shared across two or three rooms. Azerbaijan Extension – Extend your stay in the Caucus region with a three night stay in the Land of Fire – Azerbaijan, one of the least visited countries in the world. Ask us for details on the itinerary and current pricing.